Truckee Mountain Man JV Classic was held on Friday, Dec. 22. 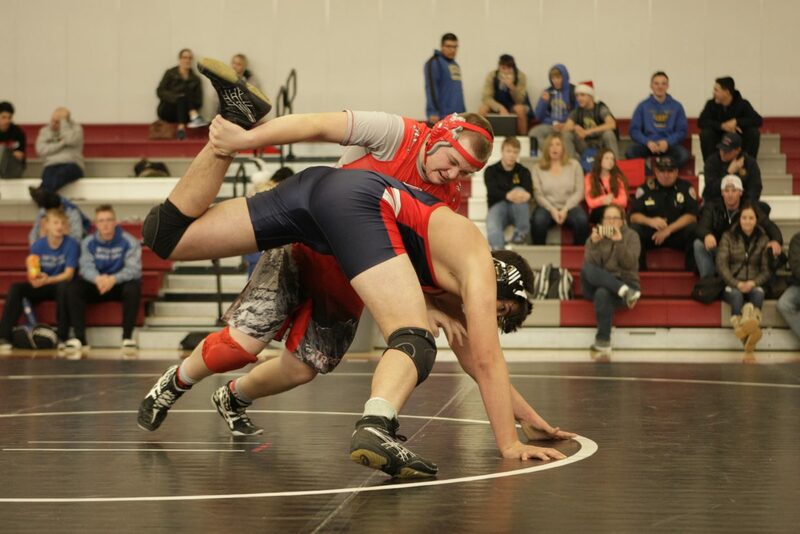 The Truckee wrestling team hosted their first meet of the season on Friday, Dec. 22, with 10 squads competing, including teams from the Reno area and one from Oakland, Calif. The Truckee Mountain Man Junior Varsity Classic provided an opportunity for Truckee’s wrestlers to go up against several of the area’s more established programs in Spanish Springs, Reed, Reno, while adding more time on the mats for the mostly inexperienced Wolverines team. The Wolverines have doubled the size of the program from last season, with 27 athletes on this year’s roster, including four girls. But most of those wrestlers have limited experience in the sport, with the exception of senior Reed Belardi, whose skill level on the mat kept him out of Friday’s junior varsity competition. Senior Thomas Daly had a strong day for the Wolverines with a pair of wins by fall in the 145-pound division to reach the first-place match against Reed’s Marco Budija. Unfortunately, Daly’s run would come to an end in the finals, as Budija picked up the win to take the 145-pound title. The Wolverines also had senior Andrew Parkhurst reach the finals of the 220-pound division after defeating Oakland’s Joseph Thomas by fall. Parkhurst matched up with Reno’s Mateo Bugica for the 220-pound title, and would be put in tough positions on several occasions, but each time the Wolverines wrestler fought to keep the match going. After battling for more than two rounds, Bugica scored the final points necessary to earn a technical fall, 20-5. Truckee freshman Micah Ivens would rebound from a 7-4 decision loss in the opening round of the 145-pound bracket with a victory by fall in the consolation semifinals. Ivens would lose by fall in the third-place match to Carson’s Izayah Pando. Junior female wrestler Miranda Parkhurst also competed for the team, but was topped in the third-place match of the 195-pound bracket by Coral Academy of Science – Reno’s Emmanuel Ramos to close out the tournament. The size of this year’s Truckee team marks a stark contrast from four years ago when there wasn’t even a wrestling program at the school. Through the work of Bennett and Truckee’s other coaches, the program is once again thriving, and while the Wolverines are still inexperienced in terms of the amount of upperclassmen on the roster, a large group of underclassmen along with an upstart youth program has raised the hopes and expectations for the once floundering program. The Wolverines will next compete at the Cougar Junior Varsity Bash on Friday, Dec. 29, at Spanish Springs High School in Reno.